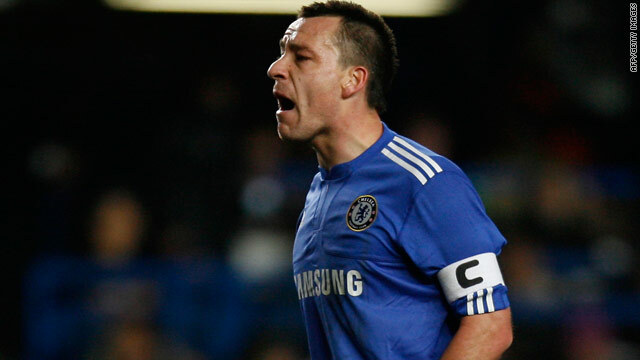 John Terry was stripped of the England captaincy following revelations about his personal life. (CNN) -- England soccer star John Terry has again been engulfed in controversy after his car hit a club steward on Tuesday night following Chelsea's Champions League defeat by Inter Milan. English Premier League side Chelsea confirmed that the club's captain had driven into one of its security staff as he sought to get past a horde of photographers and fans after the match, the UK Press Association reported on Wednesday. British media had widely reported that police said the man suffered a broken leg, but Chelsea told PA that he had only "a badly bruised leg." "We can confirm there was an unfortunate accident as John Terry left Stamford Bridge last night," a Chelsea spokesman told PA.
"When driving out of the stadium at approximately 1-2 mph in a queue of traffic exiting the ground, his car was surrounded by photographers and fans. In the melee that ensued a member of Chelsea's security staff was knocked to the ground, making contact with the car. He suffered a badly bruised leg. "John was aware at the time that there was a lot of contact with his car during the incident, but not that anyone was injured as a result. Upon hearing of the injury, John spoke to the police. He has also been in contact with the staff member to check on his welfare." Terry's spokesman Phil Hall told Sky Sports News that the player had been breathalyzed by the police, with tests showing he had not been drinking alcohol. Hall said Terry planned to visit the steward on Thursday as he was upset about the accident. The incident was another blow for Terry, whose Chelsea team missed out on a place in the quarterfinals of Europe's premier club competition for the first time since 2006. Italian champions Inter, managed by Terry's former Chelsea coach Jose Mourinho, won 1-0 on the night thanks to a late goal by Samuel Eto'o which sealed a 3-1 aggregate victory. The 29-year-old Terry has recently been at the center of a media storm following revelations about his alleged affair with the ex-partner of his former Chelsea teammate Wayne Bridge. He was stripped of the national captaincy by coach Fabio Capello as a result. Bridge subsequently decided he would not be available for selection by England at the World Cup starting in June as he believed his presence in the dressing room with Terry would be "divisive" for the team. Bridge, who plays for Manchester City, is sidelined after having a hernia operation on Tuesday which will rule him out for a month. The defender, who had only just returned to action following a knee injury, aggravated a long-term problem during Sunday's 1-1 Premier League draw with Sunderland. Meanwhile, the Premier League confirmed on Wednesday that bottom club Portsmouth have been docked nine points after going into administration last month. League officials acted after Britain's tax department dropped its legal action challenging the club's change of financial status. The decision means debt-ridden Portsmouth are almost certain to be relegated, with Avram Grant's team now 17 points from safety with only nine matches left in the season. Fellow strugglers Hull City, second from bottom 14 points above Portsmouth, confirmed on Wednesday that Iain Dowie will be the Yorkshire club's new manager until the end of this season. Dowie, who replaces the sacked Phil Brown, has previously coached Charlton, Crystal Palace and Queen's Park Rangers.